Mario and I have been working on very basic physical therapy exercises for the last few months. 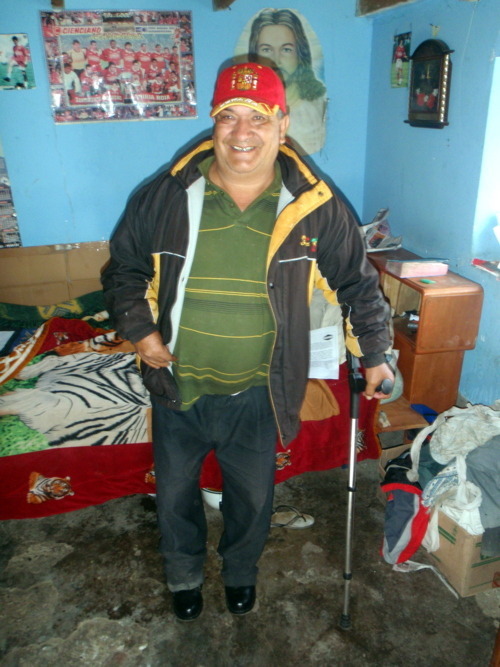 Mario contracted Polio when he was young and has lived with the physical effects since. His right arm lacks muscle tone and his wrist contracts inward so that his fingers rest just above his forearm. His right leg has hardly any muscle remaining, a stiff knee joint, and a severely flexed and pointed foot that appears as if he is a ballerina on point, all the time. He struggles to walk because of his deformed right leg and thus relies primarily on his left leg, incurring severe left leg stress fractures as a result. As with all contractures, there exists the concern that without regular exercising and muscle use the tendons will continue to tighten around joints to make the contractures more severe and the pain worsen. Mario and I working on basic stretching and isometric exercises that will bring greater mobility and strength to his right side as well as general core strengthening. Although Mario had admitted the exercises were improving his general health, his limp has and will remain that same because of the bone and muscle deformity. Mario never complains about his disability and moves through life almost as if it doesn’t exist. He has an eager attitude to learn and joyful approach to our workouts. Despite his general good attitude, he daily struggles with the pain from his gait. With some recent donations Awamaki health received, I wanted to finally give something to Mario that would allow him to get out more and not reserve himself to his room because of the pain. We went to Cusco to get special shoes made that would include orthodics to support the intense flexion of his right foot.